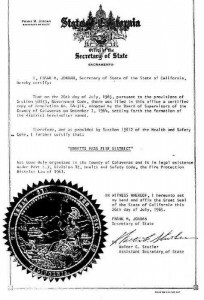 The Ebbetts Pass Fire District became a legal entity on July 26th, 1965. The Ebbetts Pass Fire District was formed December 7, 1964, to provide structural fire protection during the winter periods when the local California Division of Forestry station was not staffed. 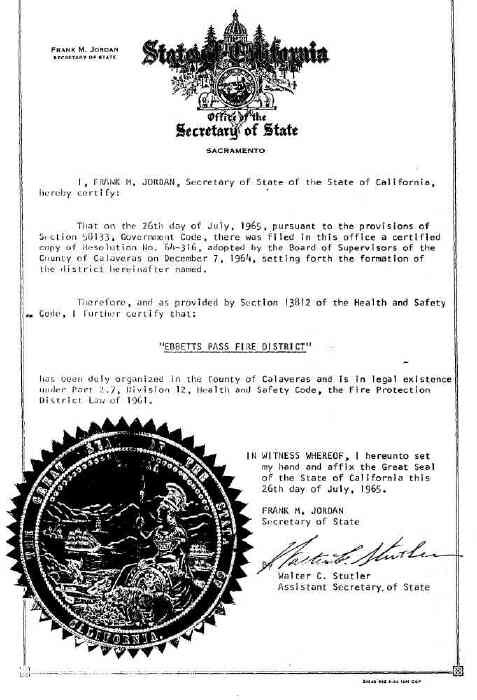 The Ebbetts Pass Fire District became a legal entity, certified by Mr. Frank M. Jordan, Secretary of State for California, on July 26, 1965. Julius Wixon was appointed as the first Volunteer Chief on October 26th, 1965. Due to the amount of time required to start the Fire District, Julius Wixon annulled his appointment on November 23, 1965, and John George was appointed. The first fire engine was a 1950 Ford F-6. It was purchased on November 9, 1965, from the California Division of Forestry in Davis, CA for $725. The District was (and continues to be) governed by a five member Board of Directors. The first members of the Board were; Hugh Preston, Ken Emerson, Fred Kern, Pete Bowman and Gus Gustafson. The first official Board Meeting was conducted in January 1965. During the first full year of the Districts infancy, there were 35 incidents. In 2018, Ebbetts Pass Fire District responded to 1,128 incidents. On March 22, 1966, Russell Beaty was appointed as the first paid staff member, as the on-duty Fire Chief. The District also purchased a second fire engine. In 1967, a parcel was purchased from Tom Wellik (Mr. Wellik would later become the first Ebbetts Pass Firefighter’s Association Honorary Member). This Ebbetts Pass Fire Station was completed on April 13, 1969. Station # 1 dedication day, 1969. 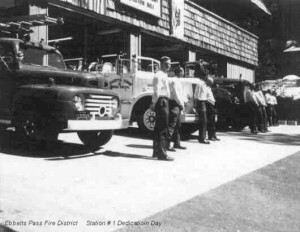 In 1968, Station # 2 in Camp Connell was constructed on land purchased from “Pop” Anderson and Engine 2 was placed in the Camp Connell Battalion. 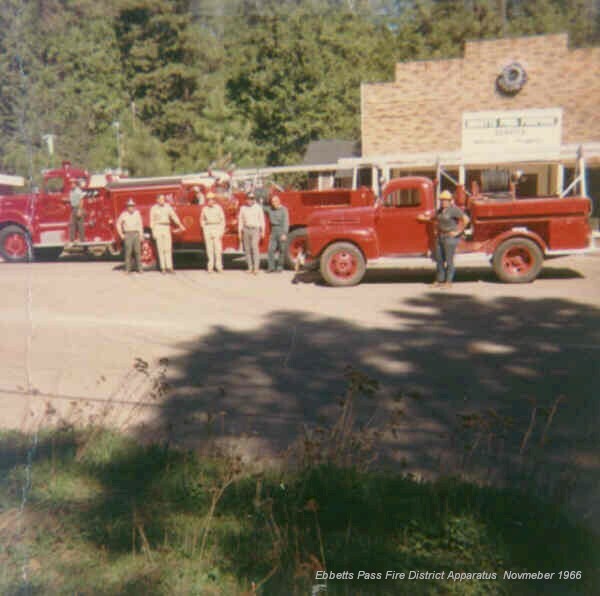 1968 also saw the purchase of property in Hathaway Pines for a future Station # 3. Chief Beaty was forced to resign due to heath reasons in 1969. John George again took over the duties until testing could be completed for a full-time Chief. In July 1970, Don Masters was hired and, after a short probationary period, replaced Chief George as the full-time paid Chief. In 1971, Beryl Ledbetter was hired as a firefighter to help provide seven-day-a-week coverage at Station # 1. Station # 3 in Hathaway Pines was completed still being staffed by volunteers. 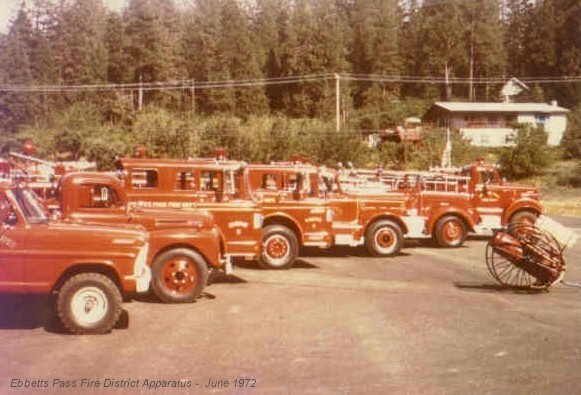 Early in 1972 the District purchased two Howe fire apparatus, and the fleet of vehicles grew to 6 engines and 1 utility/duty officer pick-up. A second firefighter was hired in October 1972. 1973 saw an endeavor to promote the fire service as a career option for high school aged kids. The “Cadet” program was begun, utilizing interested 14 to 18 year old kids whose fathers were members of the volunteer ranks. They were given the nick name “pump patrol” which later derived the slang nick name “punk patrol”. The kids took it to heart and retained it until the 90’s. This program was headed by Cadet President Kelly Seitz. Joe Roguski was hired as Deputy Fire Chief on November 15, 1973. Property for a future Station # 4 was also purchased in 1973. In 1974 the District Board of Directors adopted the first full fledged Fire Code for the Ebbetts Pass Fire District, Fire Ordinance 74-1. December 4, 1974, saw the completion and dedication of Station # 4 in Pinebrook. 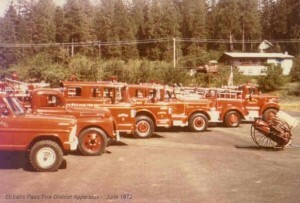 In 1975 the fire District hired a second firefighter. The paid staff then was at four. Seven-day-a-week paid staff coverage with Station # 1 staffed from 0800 until 1700. Duty coverage after 1700 hours was split at home (on call) between the paid staff members with one of the officers on call for response to incidents. The Dedicated volunteers staffed the apparatus during the night time hours. EPFD stabilized somewhat from 1975 to 1980. In early 1980 several personnel changes came to pass. Older firefighters retired or promoted and moved on to other career jobs. This allowed new firefighters to enter the fire service here in Arnold. These new firefighters began 24-hour full-time coverage at Station #1. The new Chief Officers still monitored emergency calls from their homes. The emergency services delivered to those living and visiting in the area thus evolved from volunteer seasonal winter fire protection to include a fully staffed paid and volunteer engine companies that responded to emergency medical incidents, provided for fire protection, public safety education, emergency hazardous materials response, and other emergency incidents 24 hours a day all year long. Firefighters also had to take the initial emergency phone calls and dispatch the alarms for emergency apparatus due to the area having no 9-1-1 service. 9-1-1 service finally arrived in the area in the mid 1980’s. 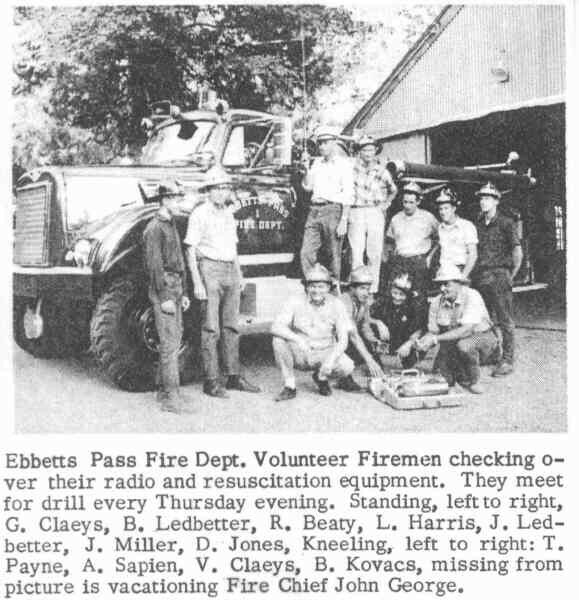 For many years the Ebbetts Pass Fire District response area was from the Utica Grade, one mile east of Murphys on State Route Highway 4, east to Meko Drive in Camp Connell. The original District covered 26 square miles in area. In 1997, due to the annexation of neighboring County Fire responsibility areas, the EPFD responsibility area grew to 204 square miles. The general area of the District now extends from the Utica Grade on Highway 4 on the west to the Alpine County line on the east. The Stanislaus River on the southern side of the District to the South Fork of the Mokelumne River on the north. The estimated permanent population of the District is approximately 8,000+. Primarily a recreational area which includes a significant number of weekend and vacation (second) homes, the number of people in the area significantly increases on weekends and holidays. Estimates of weekend and holiday population range from 15,000 to 20,000+ or greater. A 1995 study (before annexation) by Fire Loss Management Systems on behalf of Calaveras County, estimated there were 415 mobile homes, 6,000 residential structures and 230 commercial occupancies within the District. The assessed value within the District is approximately $850 million. Emergency response within a recreational area such as that in the area of the Ebbetts Pass Fire District presents very diverse challenges. Ebbetts Pass Fire District personnel must be trained in diverse subjects such as ice rescue, swift & calm water rescue, over-the-bank & technical rope rescue, and the more usual emergency medical, in addition to structural and wildland fire fighting. To meet continuing demands on the services of the Ebbetts Pass Fire District and with the ever growing numbers of people, both residents and visitors alike to the area, EPFD was approached with the proposition of beginning Paramedic service through the Fire District. The EPFD Board of Directors and Chief Wilkes thought long and hard, and entertained several budget scenarios during the late 1990′s. Approaching the area voters with a Special Ballot Measure, Paramedic service could become a reality in the Ebbetts Pass Fire District. The voters within the District approved the ballot measure with the required 2/3rds majority vote and plans were made to begin a testing process for firefighter-paramedics and to purchase the required advanced life support equipment they would need to provide service. EPFD completed a testing process that lead to the District hiring three firefighter-paramedics–one for each shift. These firefighter-paramedics, responding on Engine 435 or Squad 431, would provide advanced life support care to ill and injured patients until a privately owned ambulance would arrive on scene and transport the patient to area hospitals. This enhancement in care to District citizens ensured that care was adequate while waiting for ambulance service–sometimes up to 45 minutes. EPFD personnel soon noted there was a need for immediate transport of patients and full paramedic transport service in light of private ambulance service lengthy response times and delays–especially over very busy holiday weekends. The EMS Coordinator, Chief Officer and the Board of Directors took the concerns of the EPFD firefighter-paramedics very seriously, and the issue of full paramedic service was explored. The District applied to Regional EMS to begin full paramedic service, and the process was begun. EPFD, through the Ebbetts Pass Firefighters Association, also purchased a used ambulance and converted it to meet EPFD needs. On July 2, 2002, the latest enhancement, emergency transport, was achieved. The final approval from Regional EMS for EPFD to begin patient transport to local hospitals using Paramedic Rescue Unit, Medic Unit 431. Medic Unit 431 would be transporting patients with one firefighter-EMT and one firefighter-paramedic onboard while the paid fire engine, E-435, would remain in the District staffed with an additional paramedic to ensure continued paramedic service to our District residents and visitors. The additional paramedic will also keep EPFD in compliance with the firefighter safety issue of 2 in-2 out. In March 2003, another enhancement to the services provided by the Ebbetts Pass Fire District Paramedic Program was the purchase of a new Paramedic Rescue Unit, Medic 435 is now the first run paramedic ambulance for the paid staff out of Station # 1 in Arnold. Medic 431 became a second out and back-up unit that has been utilized for second response and special detail coverage. Beginning December 2002 and depending on area population, Medic 431 has been utilized for special coverage at Bear Valley Ski area on busy ski event days and holiday weekends. Medic 431 has also provided coverage at other local special events. The Ebbetts Pass Fire District now provides Paramedic Level First Response service to the entire 225 square miles of the Ebbetts Pass Fire District.